GlaxoSmithKline (GSK) said this week it will respond to pressure to stop paying doctors to promote its products through speaking engagements and end linking compensation for its sales representatives to the number of prescriptions doctors write. The move comes amid a major bribery investigation in China. It also plans to stop payments to healthcare professionals for attendance at medical conferences by the start of 2016. Authorities say a major bribery investigation in China accused Britain’s largest drugmaker of corrupt payments to doctors and officials to boost its drug sales. 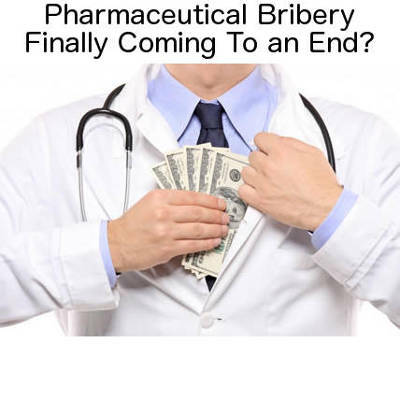 In 2012, GSK was fined $3 billion and plead guilty to federal charges to resolve a slew of criminal and civil issues stemming from its use of kickbacks, misbranding and other misconduct to market drugs such as Paxil, Wellbutrin and Advair. The agreement was the largest health care fraud settlement in history, spanning nearly every state, according to the Justice Department. It’s was also the largest payment ever by a drug company. The company illegally marketed depression drug Paxil to children and teens, even sponsoring dinners and spa programs in the drug’s name, prosecutors said. Glaxo also used sham advisory boards and speakers at lavish resorts to promote depression drug Wellbutrin as an option for weight loss and a remedy for sexual dysfunction and substance addiction, according to the government. Customers were urged to use higher-than-approved dosages, the government said. GSK as well as the largest pharmaceutical companies have been paying off the researchers of medical studies for decades. Richard Smith, the ex-editor of the British Medical Journal (BMJ), publicly criticized his former publication, saying the BMJ was too dependent on advertising revenue to be considered impartial. Smith estimates that between two-thirds to three-quarters of the trials published in major journals — Annals of Internal Medicine, Journal of the American Medical Association, Lancet and New England Journal of Medicine — are funded by the industry, while about one-third of the trials published in the BMJ are thus funded. He further adds that trials are so valuable to drug companies that they will often spend upwards of $1 million in reprint costs (which are additional sources of major revenues for medical journals).